Beware the Ides of March said the soothsayer to Julius Caesar before he was brutally murdered by his customers. With the launch of the Galaxy S IV, the same could have been said for Samsung. The fanfare around the launch was new for Samsung, seeking to gather as many eyeballs as Apple does for their cryptic events. While tech pundits complained about the mash-up between Mad Men and Leave it to Beaver (rightfully so it seems), Argus Insights was busy understanding how the big S compared to the big A with their Big Apple (pardon the pun) event. 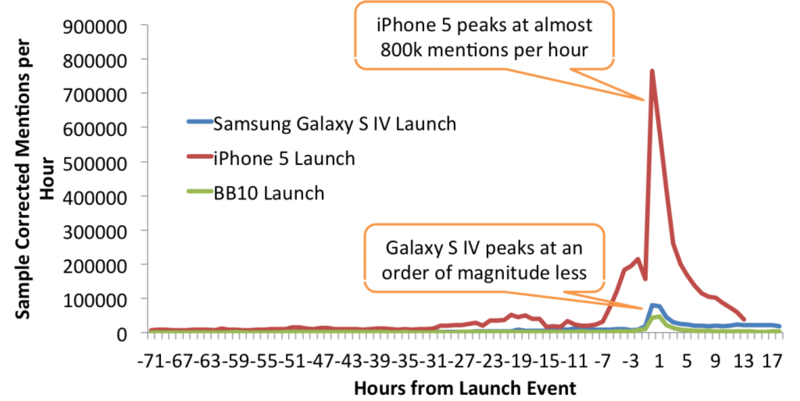 When we compared the hourly social mention volume between the iPhone 5 launch in September 2012 and the March 14, 2013 launch of the Samsung Galaxy S IV, there is no comparison. The iPhone 5 event attracted almost 10X the buzz of Samsung. Samsung did beat out RIM’s BB10 launch in January by a fair margin, almost 2X. So little surprise that Samsung wasn’t able to compete with the iPhone 5 launch. The silver lining is that Samsung didn’t have the post launch fall off that Apple or RIM did. 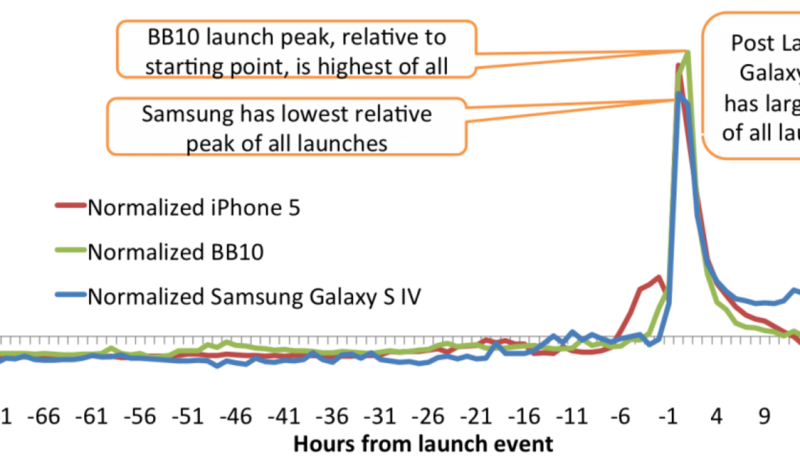 When we normalize for the days prior the launch, though Samsung comes in third place, meaning that both Apple and RIM had bigger lifts in social media in comparison. While the RIM overall volume may have been the lowest, it was a big event for them, pushing proportionally more awareness than the Samsung event. How will this translate to sales of the Galaxy S IV? Reach out to Argus Insights to find out. We’ll be releasing our new Smartphone and Tablet Demand Side Forecast in the middle of Q2. Email if you’d like a free copy of the inaugural issue, sales@argusinsights.com.